Challenging myself to write this post in the next 11 minutes. Otherwise I obsess and try and make it perfect. Ready, go! I've heard from a few friends and coworkers that they're hosting their Thanksgiving this year and are worried about what to make. They want to do something easy but a crowd-pleaser but healthy and that seems like too much to ask, especially when there could be kids (or picky adults) to deal with. Never fear! I've got a few quick recipes that are our go-to's for my favorite holiday. P.S. It's one of our favorite things to wander the neighborhood and see what's naturally growing and take advantage of free herbs and fruits and veg. We happened have this abandoned lot down the street with tons of fresh rosemary growing like weeds. 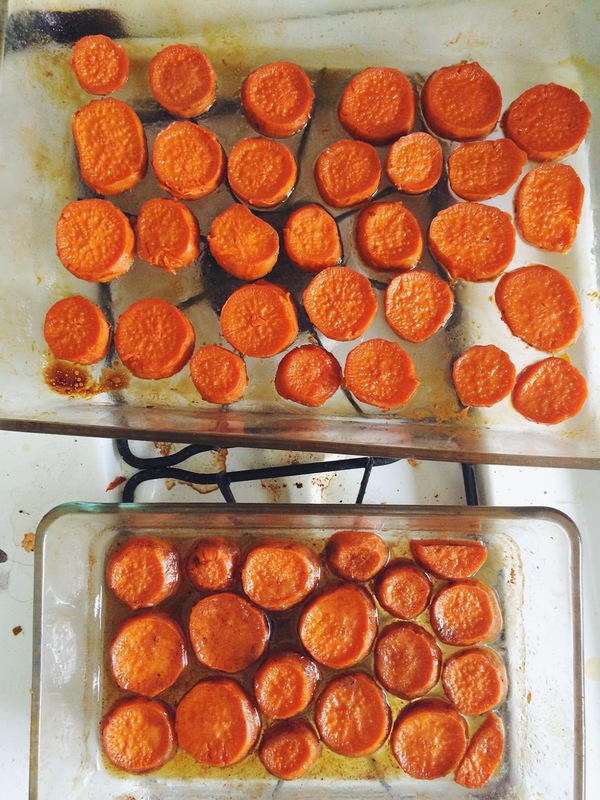 So we thought we'd do them a favor and use some with our sweet potatoes. 1. Cut ends off of washed green beans and pat dry. 2. Get a wide pan hot with a splash of oil and add green beans. Add a splash of water carefully. It should sizzle. Put a lid on top to steam for 3 minutes. 3. Remove lid and add minced garlic, pepper, and few tablespoons of soy sauce. Keep stirring until beans are cooked but crisp. Voila! 1. Peel sweet potatoes and cube into 1 inch pieces roughly. Toss in a bowl with oil, salt, and pepper and evenly distribute on a baking sheet. Roast at 400 degrees for 30-40 minutes until tender. 2. Remove and carefully toss potatoes with minced garlic and rosemary. Roast for another 10 minutes until fragrant and garlic begins to soften. NOTE: This recipe would go super well with regular potatoes too! I'd use yukon or red potatoes over Idaho. 1. Wash and slice cauliflower and broccolini into florets. Pat dry and toss with oil, salt, pepper, and squeeze with juice of half a lemon. Include bits of lemon rind or thin slices of lemon for extra lemony flavor. 2. Roast veggies on a baking sheet at 400 degrees for 20-30 minutes until tender but crisp. Hi! My name is Megan. I moved to two big busy cities after living in an outdoorsy college town. I created this first as a blog about cooking food, finding local joints, climbing mountains, and staying happy and healthy. Today, it's a place where I've bring people together around cooking darn good food through Seasoned Cook workshops. My hope is that you leave my site or workshops with the belief that you #loveyourkitchen.